This article has initially been written in French to explain how Google Trends was receiving more and more advanced semantic features. It’s never easy to translate, so I will try my best to adapt my original copy to English. This ‘answering machine’ is obviously smarter when you ask questions in English, but a lot of answers are also given in other languages (I can tell you that basic questions about people are answered in French too). When the request is not a question, it is also frequent to receive a lot of meaningful data (often that will occur when you type the race of an animal or a plant, a monument or some famous people name). 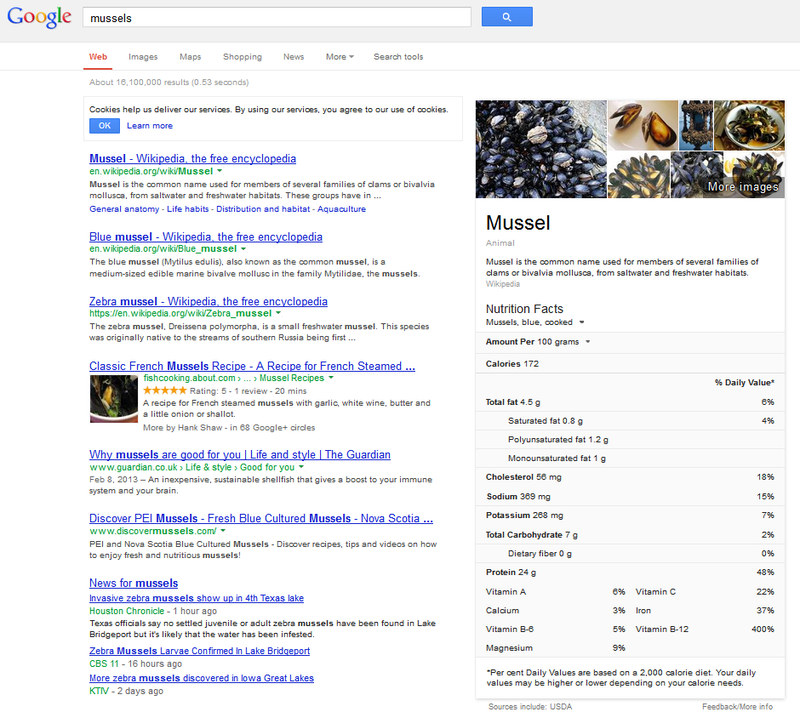 On the following example you can see that the nutritive values from mussels are displayed and extracted from the USDA. I am not going to explain any further because it has already been described a lot elsewhere and you probably have already see it by yourself. The main question that remain unsolved now is : is there any reward for knowledge-oriented websites if Google answer questions in place of them? Should webmasters keep publishing websites that bring common knowledge to people or is it a waste of efforts? If you want to give your opinion, please use the comment form below. My point of view is quiet extreme, I think that this update will probably kill the smallest content producers : their website will attract less interest over time since answers are given directly by Google. Alright, so none of this is new, let’s move on to the real core of this article : Google Trends. Google Trends is a very useful tool to discover search volumes associated to given keywords. You can for instance compare the crowd interest for “Hollande” versus “Sarkozy” and see the time evolution. For that, you will use the followingg URL : https://www.google.com/trends/explore . The tool is really useful to discover (guess what…) trends in time. You can also track down which countries show more interest for a topic. Until now, nothing is new for most webmarketers. But what was really disruptive at the time of the original post (March 12th 2014) is that Google Trends is now linked to the Knowledge Graph and Freebase. This relationship is really more visible on Trends than on the classical search. For instance, you can come across related searches for the query ‘François Hollande‘. There is a lot of data about Holland on Freebase, you can find his previous wife (Ségolène Royal) and partener (Valérie Trierweiler) , but nothing about this “Julie Gayet”. So why is Google Trends showing us her name here ? Well, here is the innovation : Google Trends is able to discover the link between two named entities ! Of course, it uses frequent searches and is able to discover that at some point of time the queries “Holland” and “Gayet” were often used in combination. But is also added a semantic layer and decided that these terms were related to the French politics scene. (Note : Julie Gayet was famous few month ago when ‘Closer’ a gossip magazine made public that Holland had an affair with the actress Julie Gayet during his 2nd year of presidential term). I guess that this example is not the clearest, and that here it might be difficult to decorrelate most of the queries, but it’s clear that people started to ask Google about the movie in 2007. The most striking feature of Trends/Knowledge comes from terms disambiguation. Try it on various keywords you know have homonyms. Whereas on Freebase you will have a very detailled list of homonyms, Trends only keep the most important ones. So, coders can quickly create a tool to gather a lot of information about Edith Piaf for instance. Is the new semantic Google the end of SEO ? With the Hummingbird’s update, content editor will face more and more troubles. If answers are directly offered by Google, users will not need to visit your site anymore. It’s easy to bet that it will become harder and harder for knowledge based website to survive. Search Engine Optimization might be dying, but for sure Semantic Engine Optimization is on the rise ! If you want to adapt this article to your own langugage and publish it somewhere, I strongly support that. Send me an email or post a comment here when it’s published and I’ll add the link here.